I’m not an employee of the State Historical Society of North Dakota. Why then, do I spend most of my retirement days either at the Heritage Center or working on various projects with the assistance of the staff of the State Historical Society? In my opinion, the Heritage Center is the most interesting and exciting place in town. Space on this blog will not permit a complete list of the reasons why I find the North Dakota Heritage Center such a fascinating place to spend my time. I do, though, want to touch on a couple. I serve as president of the North Dakota Archaeological Association (NDAA). As an “enthusiast” (not a professional archaeologist), I am involved in research on a wide variety of topics and the presentation of that material to our members. I could, I suppose, do that research without the staff and resources of the State Historical Society, but it wouldn’t be nearly as fun or productive. 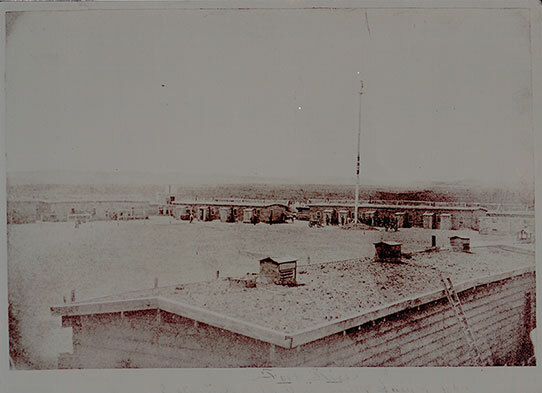 A recent and ongoing project of the NDAA is the study of various aspects of the Fort Rice State Historic Site, a military post south of Mandan, ND, circa 1864. To prepare for a recent NDAA field trip to Fort Rice, I had the opportunity to work with State Historical Society staff in the Archaeology and Historic Preservation and Archives divisions. Where do you begin a project as large as the 14-year history of a military post with a large cast of characters, documents, images, and stories? It’s easy. Just ask anybody in either division for information. 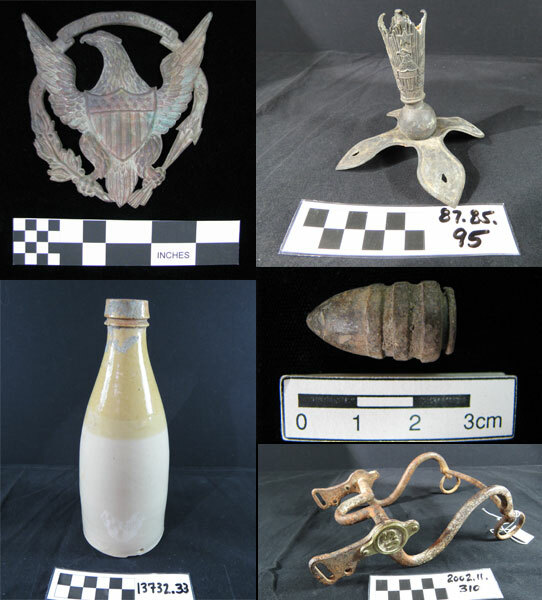 My first information request pertained to the availability of artifacts related to Fort Rice - those objects left behind after the occupation of the post. Wendi Field Murray, archaeology collections manager, and Meagan Schoenfelder, collections assistant, assured me that it was not a question of availability. It was more a question of what specific kind of artifact I was interested in. Long story short, I ended up with more information than I could use on what I termed the “bottles, buttons, and bullets” project. 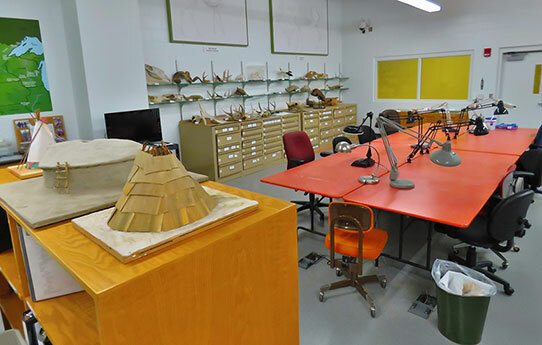 All of the artifacts are securely housed in the new, state-of-the-art collections rooms. There, the objects are carefully organized, cataloged, and available for examination (by appointment) and, in some cases, photography. Top Left: Stamped brass eagle worn on enlisted man’s dress helmet at Fort Rice, circa 1872. After I had chosen the images of the artifacts pertaining to my presentation on Fort Rice, I went upstairs to the State Archives. Again, no problem in assembling information. The question was not “if” the information was available. The question was, what specifically was I looking for? Sarah Walker, Greg Wysk, and Jim Davis are the people with the answers. The information I was looking for was available either on microfilm, in the periodical stacks, or in the climate-controlled archives of the State Historical Society. One particular image I was interested in was of the first buildings at Fort Rice. I was pretty sure a photo was not available. Jim located it in about three minutes! What could have been a long, time-consuming search for material for my presentation was accomplished in no time with the assistance of the Society’s staff. I have two other quick mentions. Finally, I have had the opportunity to work with the archaeology staff on more advanced areas of study; the lithic comparative collection – a collection of stone raw materials that were used by Native Americans to make projectile points and other stone tools, and the faunal collection, consisting of modern animal skeletons that are used for comparative research. I could go on and on but I have research to do, and I know where to find the answers I am looking for… the State Historical Society of North Dakota.